Each Apple iPhone device has unique serial number, International Mobile Equipment Identity (IMEI) number, identifier or ICCID number. An iPhone user may want to know these details of iPhone device at hand for further use. There are number of ways to check such details of an iPhone. You can check serial number details by looking at the back of iPhone device. The serial number and IMEI details are engraved on the metal case at the back. 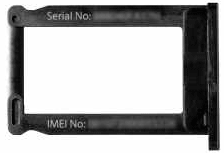 Serial number and IMEI number is also written on the SIM tray contained in the iPhone device. Pull out the SIM tray to view such details. Please note, SIM tray is location in iPhone 4 is different as compared to iPhone 3 and 3GS. 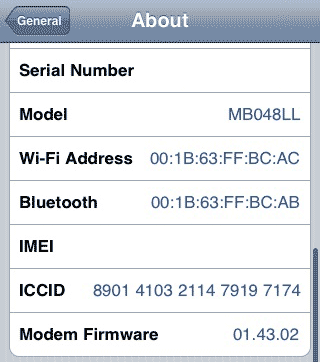 iPhone serial number, IMEI and ICCI information can also be viewed from iPhone About screen. From the Home screen, goto Settings > General > About and scroll down to see required details. 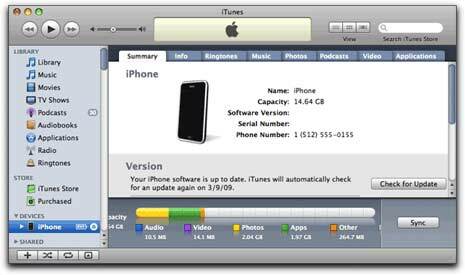 Connect iPhone to computer and open iTunes. Then select iPhone from left hand side of iTunes interface. Click ‘Summary’ tab to view iPhone serial number details. Then click phone number to view IMEI number. Further click IMEI number to view ICCID number. Can you tell me what the carier and country for this…? I hve bought IPhone 5 from chinese seller,but the problem is, i still don’t know what is my IPhone 5 brand!! This is a big one for many people, and we have some fairly surprising news to report. The battery life on the iPhone 4 has been outstanding thus far, exceeding our expectations for longevity during testing. We’ve only had a short time to use the phone, but in the week or so we’ve been carrying the device as our main phone, we’ve had pretty amazing results under normal to heavy use. In fact, we managed to squeeze more than 38 hours — yes, 38 hours — of life out of a single charge using the phone as we normally would. We’re talking calls, some gaming, lots of push email and calendar invites, playing music over Bluetooth in the car, and just general testing (like downloading new apps, rearranging icons, tweaking settings). We went from 10:30AM on a Saturday morning till 1:00AM on Monday without needing to charge the phone. How do I check online if an IPhone 4 is an original mobile from apple before I buy it? Note: All I have about that mobile is its serial number which known by the IMEI 012430003516791. Can you please show me the tips with many thanks in advance.